Founded in 1978, Lapland Lake features unparalleled woodland skiing on a superb trail system designed by Olavi Hirvonen, former U.S. Olympic skier (1960, Squaw Valley). Tucked away in a unique snow basin in the heart of snow country and enjoying some of the most reliable snowfalls in the East, Lapland Lake offers lengthy winter seasons, frequently beginning in November and continuing into April. Immerse yourself in the splendor of the Adirondack Preserve while gliding through majestic forests and alongside scenic streams and lakes while catching glimpses of white-tailed deer, otters, snowshoe rabbits and winter birds. Sheltered by majestic pine and hardwood forests, 38 of our 50 kilometers of trails are trackset with skating lanes. The vast majority of our trails are one-way, uncommon in the industry, providing skiers and snowshoers with a remarkably peaceful woodland experience. Lake Trail is illuminated nightly exclusively for the use of our overnight guests (click here for Adirondack Lodging options). 12 kilometers of trail are ungroomed, marked and mapped snowshoe trails which provide a solitary Adirondack wilderness experience within our private lands. 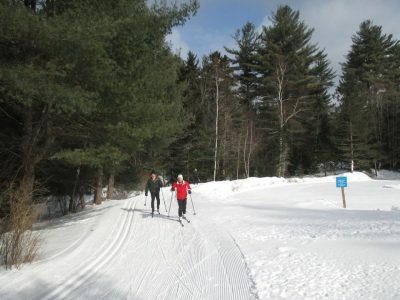 Lapland Lake welcomes the first-timer as well as the expert – the skater and the classical cross country skier. Our PSIA-certified (Professional Ski Instructors of America) Ski School boasts 15 job-sharing Ski School instructors who offer superb instruction in group, private or semi-private settings to junior and adult skiers of all ability levels. 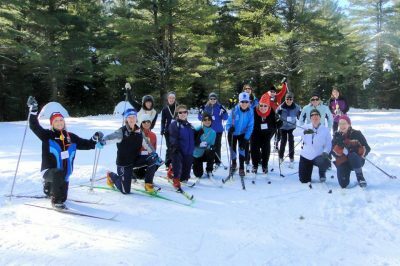 Special day-long ski clinics are scheduled during the season for women. See our winter calendar for details. Our Kuuma Feeding Station is on the second level of the “Finnish Line” Lodge. This quick-stop location is open daily in the winter offering breakfast goodies and lunch. Wine and beer are available at the Kuuma Feeding Station. Snowshoeing, ice- skating, wilderness ski touring, sledding, tubing, along with child-carrying pulk sleds and Scandinavian kicksleds add variety to your day. Lapland Lake offers a variety of special events all winter long and is conveniently located near four alpine areas: Royal Mountain (25 minutes), Oak Mountain (45 minutes), Gore Mountain (one hour) and West Mountain (1-1/4 hour). The Benson Trailhead of the famed 133-mile marked and mapped Northville-Lake Placid Trail is just minutes from our door and offers an amazing wilderness experience for backcountry ski and snowshoe enthusiasts. Those wishing to enjoy an outing with their dog often enjoy the NPT. Once your pup has received plenty of good Adirondack fresh air and exercise, return to Lapland Lake and ski our groomed trails while your furry friend takes a well-deserved snooze in your vehicle. The Zahray family invites you and your friends and family to visit for a day-long escape to enjoy some Adirondack skiing or to savor the Nordic experience and linger even longer. Lodging is offered in immaculate rooms or tupas (private housekeeping cottages), each with a fully equipped kitchen, living room, up to four bedrooms, electric heat, woodstove and bath with shower. Click here for tupa details. After a delightful day on the trails, relax in our authentic wood-burning sauna or indulge yourself with a therapeutic massage provided in your tupa (Adirondack cabin) by a professional NYS licensed masseuse. Did you know that cross country skiing burns more calories per hour than any other sport – an average of 650 calories per hour? The endorphins released with aerobic activity boost your well-being and elevate your mood. Combine that with Lapland Lake’s gorgeous southern Adirondack setting and you have the perfect recipe for fitness, health and happiness! Read more about how cross country skiing is great exercise. Plan to join us for a truly unique winter escape. Tavataan ladulla! See you on the ski trails!